The acreage estimate of a wind-whipped brush fire in Ventura County has increased, but firefighters are nearing full containment of the blaze. 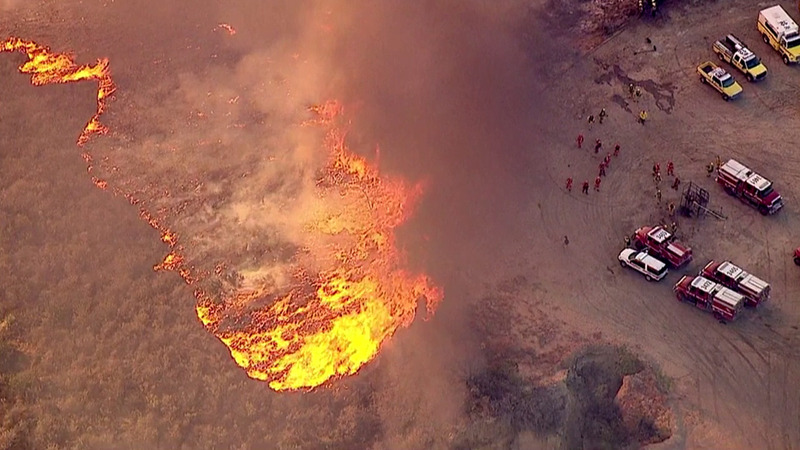 VENTURA, Calif. (KABC) -- The acreage estimate of a wind-whipped brushfire in Ventura County has increased, but firefighters are nearing full containment of the blaze. The Ventura County Fire Department said the fire is 87 percent contained and has burned 1,388 acres on the hilly Solimar Beach coast, according to current maps. An earlier estimate charted the burned area as 1,230 acres. Full containment is expected on Tuesday. A large fast-moving brush fire ripped through the hillsides between Ventura and Carpinteria at Solimar Beach early Saturday morning. Firefighters continue to put out smoldering spots, but the number of personnel on the line is being reduced throughout the day as progress continues. Now, firefighters worry that the charred areas the blaze left behind could become dangerous mudslides during the El Nino season, resulting in another shut down of the 101 Freeway. "We've had mud before. We've never really had it in the house. We're concerned this time because we've never really had this much fire all of the sudden. I mean all of this is all gone, so it's going to be an issue," Solimar Beach resident Mona King said. Firefighters are now planning how to protect the homes and roadways from potential debris flow. Ventura County Fire Department, California Highway Patrol and Caltrans want to make sure nothing damaging happens. A small contingent of firefighters will remain at the scene to patrol the area as gusty winds are expected to return Monday night into Tuesday. Power lines arcing in high winds ignited the fire shortly before 11 p.m. Friday. The blaze spread quickly, fanned by 50 mph winds, and caused the 101 Freeway and Pacific Coast Highway to shut down for a time. Evacuation orders in Solimar Beach and Faria Beach were lifted.